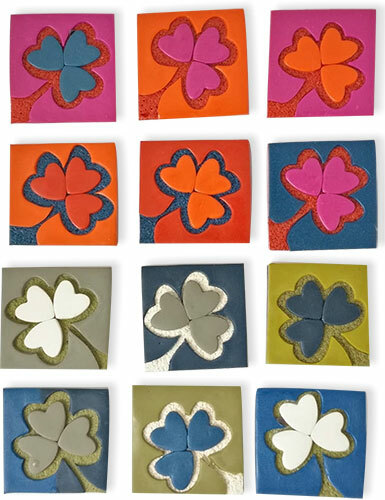 Ireland’s Fiona Herbst leads us into March with her collections of shamrock tiles. Look closely and you’ll see how hearts turn into shamrocks for Paddy’s Day. These have an Andy Warhol look with their blasts of color. But actually, Fiona was inspired by Bettina Welker’s leaf brooch. Genevieve says she’s home from the ACC Baltimore show and ready to jump back in and refine this design. The tangle of loops on one side adds to the surprise. Let’s watch and see how her idea develops. Speaking of new developments, you’ll want to be sure to attend tonight’s free I Love Tools podcast on Craftcast at 7:30 ET. I’ll be there covering some of the hot tools for polymer artists. Mags Bonham will cover the latest developments from the Silhouette side of things. It’s free and fun and available later if you’re too many time zones away. Bring a beverage and party with us tonight! 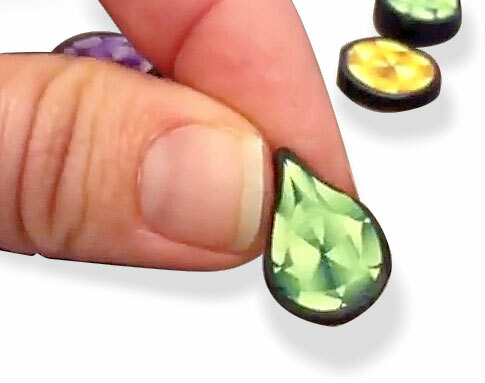 Arizona’s Meg Newberg has unlocked the secrets of gemstones with her latest tutorial. Make the cane and then shape each slice into whatever cut you prefer- brilliant, pear, marquise, emerald? Meg sorted out the facets and organized them into a step-by-step for those of us who work with more malleable materials. Don’t love to make canes? Meg also sells her diamonds in 2″ long canes ready for slicing. Australia’s Gilly Scott (clayladydownunder) makes us think spring is possible with this rainbow bud. The winter wind is still howling but we all trust that there are fantastic forces like these pushing up to the garden surface. I hunted for precise instructions on this cane and they are easy to find. Getting the colors clean and clear is trickier. Perhaps Gilly will share pictures of her method. If you need a spring boost, try one of these rainbows to lift your spirits. 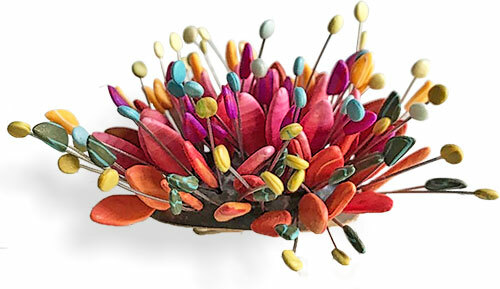 Bonnie Bishoff offers us a bouquet of buds with her latest brooch. My heart did a little flip for the colors, the simplicity, the beauty of this piece that she’ll be offering at the ACC show in Baltimore this weekend. It seems to promise that spring is on the way. Don’t you want to brush your fingertips over the buds? 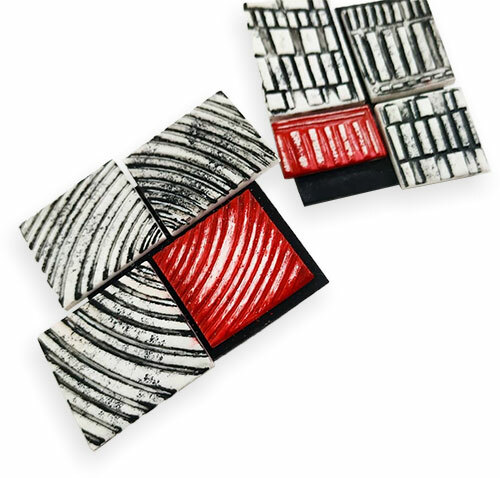 On StudioMojo we’ll be discovering other polymer artists in the ACC show. 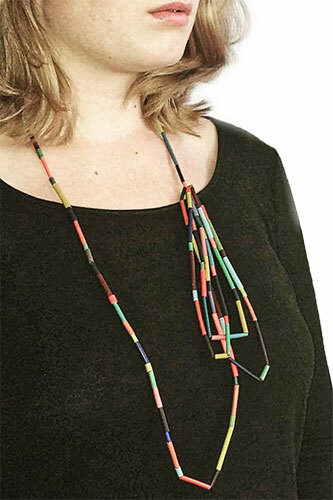 The emerging artist award went to a polymer artist who’s new to PCD. Come on over and see all the exciting stuff that doesn’t quite fit into the daily posts. France’s Marion Le Coq (FancyPuppet) enlivens our week with these graphic collages on Instagram. She’s been reviving her YouTube channel and taking her work in new directions like this. Instagram is the best place to get an overview of her work and to get a sense of where she’s headed. Are these textured and painted or silk screened? I’m not sure. We’ll have to follow along and find out. This week’s snowstorms lengthened my visit with family. I was out of action longer than I anticipated. Not to worry, I’m back and raring to go.